Harder wearing, for screws driven into general construction materials (soft-jointing), also ideal for repetitive work. 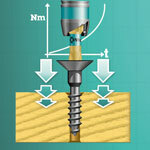 Patented BiTorsion® system prevents bit breaking & dramatically extends service life. Unique heat treated zone absorbs peak loads while driving screws, highlighted with green band. Significantly extends serice life over standard bits.